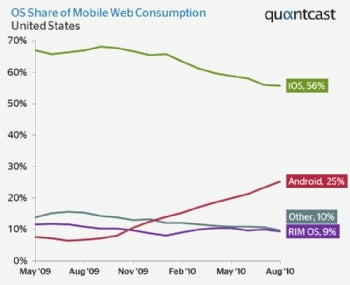 The Android Star is Rising, How Will Apple Respond? However, the market figures do represent a new way that NetMarketshare has adopted to calculate market share for Apple. "In order to more accurately describe usage share for Apple devices, the iPhone, iPod Touch, and iPad are now being grouped under their common operating system iOS," the firm explained.